Last night when Joe was getting into his pajamas, he wrapped your karate white belt around his waist. He said to to me that he wished he were older when you were alive. I asked why, and he explained that he feels he doesn't know you all that well. He was so young when you died. I pointed out to him a picture of the two of you together that sits on a shelf in his room. He was in a stroller and you were all swollen with steroids. 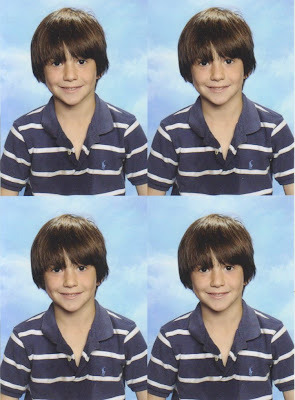 We just got your brothers' school pictures. They're kinda handsome themselves. No sign of me anywhere. It looks like they took Joe's picture either after a trip to the water fountain or after recess. Knowing your brother, that is sweat on the front of his shirt. Joe loves to sweat and to point out that he is sweating. A big source of pride for him. They are loving their long hair. Mom wants to cut it just so they can see. I'm neutral. I figure they'll ask for help when they need it. It isn't just them. Take a look at these photos I took of them with Sam and Joey Shoyer this weekend at Butlers Orchard. They could all be brothers, or Beatles. Hey, check out Dr. Rosenwaks. Mom saw this in a newspaper this weekend. 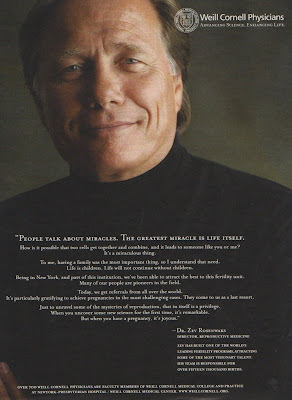 I always used to joke that somehow his patients all got pregnant 'cause he was just so good looking. We never really got close. I know he respected and cared about Mom a lot. I still remember the day we all busted into his office. Happy Birthday. We went out to the cemetery after Jake's Bar Mitzvah. It was pouring so hard that we didn't spend much time with you. Mom bought a pumpkin - she is so smart - to put on your headstone. I left a Barack Obama button (off of Mom's coat) and Grandma Phyllis' grave. I am sorry she isn't alive to see what is about to happen. I guess it was fitting that in one of the driest Octobers ever, it should rain and be dark and dreary. Friday beautiful. Sunday gorgeous. Saturday smokey, rainy and miserable. The Bar Mitzvah was great. It was warm and perfect. Jake was impressive. You'd have been proud of your friend. 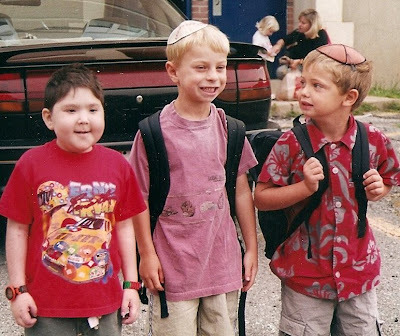 To have you with me, I wore one of your old kippahs. It is falling apart. It was a good reminder of you. For the Torah service, I read Bereshit and then Helaine read and then Jake's aunt and his uncle and grandfather. I felt like I was part of the family which made it very special. I got a great hug from Richard when I came down from the Bimah. I know he was welling up with incredible pride for Jake and his beautiful family, but he was also thinking of you. It was interesting that the Rabbi made mention of Adam and Eve's "excruciating" loss of Abel, "the loss of a child." But I read the text and commentary and there seemed to be no mention of how Adam and Eve felt when their child died. They just went and had a replacement kid - Seth. Pretty amazing that the loss of a child is right up there at the very beginning of the Torah. Jake did his D'var Torah on Cain asking God, "Am I My Brother's Keeper." As Jake pointed out, Bereshit is the most-well know part of the bible, but I felt like I didn't really know it all that well. I want to read into it a bit more. Of course, being your birthday made it extra emotional for a lot of people who were there. I looked down our aisle and saw Nana and Papa, and behind us were Ari, Simon, Alex, Sid and Susan. We were surrounded by all our friends - everyone who'd be there for your Bar Mitzvah or the annual dinners we have on your birthday at Cactus Cantina ever since you died. Strangely and unexpectedly to me, I wasn't emotional or anything when I was up there reading. I was in a zone and actually my mind started to wander while I read - it went for about 10 minutes because you go through each day of creation - but not to any place sad. I had been sad leading up to it all. I had gone to the synagogue on Thursday to get a sneak peak at the Torah when Jake was having pictures taken and doing a run-through for the Cantor. While I sat there and watched Jake practice his speech, tears rolled right down my cheeks. Also, when we were over at their house earlier in the week to eat in the Sukkah, I watched an early cut of the video that Helaine made and I welled up. It wasn't the picture of you and Ari and Jake and Simon that made me sad. It was thinking that I wasn't going to make this video for you, or maybe that I will. Here is the shot that Helaine put in of you guys. Me being me, I grabbed them at the Bar Mitzvah party and took an updated photo. Ten years later and everyone's still pretty good buds. The party was a lot of fun. Jack got into it more than I've seen at any other of these. Personally, I'm not in love with the Kayne West shades or trucker hats, but it was good that everyone else was letting loose. This is what I would have wanted out of James Christopher's parents when they met President Bush. They have black bears down in Louisiana. You can be respectful and voice an opinion that is contrary to what the President believes. As I said to someone recently, if I were James Christopher's dad, I would ask the President "How can you look at my boy and not do everything in your power to save his life?" It all just seems so passive and capitulating - which is a big word for "giving up." This is life or death. Just call her Mama Bear. Gov. Sarah Palin said Sunday that the hardest part about public life as the Republican vice-presidential nominee was the news media coverage of her children. That, Ms. Palin said, brought out the grizzly bear in her. “The toughest thing has been the shots taken against the kids, against the family,” said Ms. Palin, according to a partial transcript of an interview with WWOR, a television station that serves New York City. (CBS) In November, Americans decide whether Barack Obama or John McCain becomes the 44th President of the United States. In the series "Presidential Questions," CBS News anchor Katie Couric asks questions that move the candidates well beyond the usual sound-bites. Some questions concern policy. Others are more personal. All will give you a better sense of who these men are - and what has shaped them. What follows is Couric's question - and the candidates' full answers. I guess it is easy to see Joe's "presidential wish." At least it isn't "Gross Weiner." Mom told me that a woman who walked by the house said that Joe's sign is her favorite Barack Obama campaign sign. She said that she likes walking by the house and seeing the sign. I am sure it makes a lot of people smile. That's Joe's "too cool for school" look. I know this is totally shallow of me to say (especially when we are talking about such a serious disease), but Blaise and Madeline are the most handsome looking FA kids I have ever seen. They don't appear to have the "tell-tale" close set eyes. They seemed to have been spared the severe birth defects. I wonder where Hampton Cove is. Scott and Nancy Finnegan learned last year that both their 17-year-old son, Blaise, and 13-year-old daughter, Madeline, have Fanconi anemia. They will eventually need bone marrow transplants to survive. Madeline and Blaise also have aplastic anemia, meaning they have lost some bone marrow, and is being treated by a Minneapolis doctor who specializes in Fanconi anemia. On October 31st, a bone marrow/blood drive sponsored by Life South will be held at Hampton Cove Middle School in hopes of finding a donor for Blaise and Madeline. Siblings are usually the best bone marrow donors, but the Finnegans’ youngest child, 8-year-old Trinity, is not a match. The ordeal began in March 2007, when Madeline, now in her final year at Hampton Cove Middle School, went to the doctor because of stomach pain and vomiting. Her pediatrician suspected appendicitis, but tests showed problems with her red blood cells, white blood cells and platelets. Eventually, Madeline developed sores in her mouth and throat and was sent to St. Jude for a bone marrow biopsy; she was diagnosed with Fanconi anemia a few days later. Fanconi anemia is a genetic blood disorder that causes bone marrow failure and often leads to acute myelogenous leukemia. Even after bone marrow transplants, Fanconi patients have an increased risk of developing cancer and other serious health problems. Blaise, a Huntsville High senior who plays bass guitar and golf, was diagnosed while being tested for a bone marrow match for his sister. Neither child appears sick, but must be careful to observe signs related to Fanconi anemia. Madeline and Blaise will eventually need a match if their bone marrow continues to fail. Nancy is Mexican, so there may be an increased chance to find a match within the Hispanic ethnicity; but we encourage all to support the effort in finding a positive bone marrow match. We are asking for your support at the bone marrow/blood drive on October 31st at Hampton Cove Middle School from 7a.m.-7 p.m. Bone marrow testing is a painless swab of the check with a Q-Tip. While I think it is great that James Christopher got his wish - he deserves it - and it reminded me of you and President Clinton, I have trouble understanding how these folks can be so enamored of a President who doesn't support measures that are necessary to save James Christopher's life - namely, federal support for embryonic stem cell research. The bone marrow drives are great but they are only a small part of the total picture of what's needed to save James Christopher's life. What do you do once you identify that donor. As Dr. Wagner points out, the life saving advances in stem cell transplantation for FA and other diseases have been made possible because of research on embryonic stem cells. I guess it is convenient for everyone in the article to overlook this truth. Or they understand that completely and are what we call up here in the North: "hypocrites." Along with President Bush's very public opposition, Rep. Alexander, who appears to have coordinated this visit, votes against expanding embryonic stem cell research whenever it comes up in the House of Representatives. Unfortunately prayer and the President's confidence aren't going to save James Christopher - better tissue stem cell and umbilical cord transplant protocols and therapies will. My "presidential wish" is that we elect a leader who will take the hard but necessary steps to save James Christopher's life and other kids like him. Young James Christopher Allums is going to have a tough time topping Monday’s field trip, and he’s got the T-shirt to prove it. Allums, 11, who’s fighting a rare, possibly terminal bone disease called Fanconi anemia, met President Bush in Alexandria, then toured Air Force One with his parents, Ellen and Chris Allums. “I was nervous and excited — both,” said James Christopher, who said he has been a fan of Bush since he was 4 and his parents, freelance florists and decorators, were among those called upon to provide flowers for Bush’s first inauguration. Fifth District U.S. Rep. Rodney Alexander, R-Quitman, arranged the meeting, and Alexander and Bush began waving to James Christopher soon after they stepped off Air Force One at Alexandria International Airport. “We were just beaming, and tears were pouring down my face,” Ellen said. Bush hugged all of the Allumses and put his hands on James Christopher’s shoulders. “He said, ‘You’re a strong young man, and I think you’ll be just fine,” the boy said. 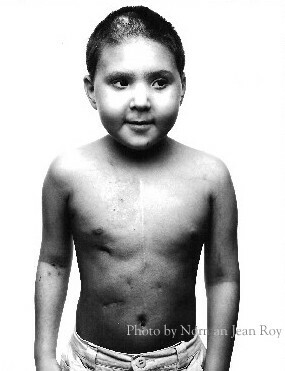 Allums’ parents have dedicated the past few years to searching for a bone-marrow match for their son. Without one, Chris said, his son’s disease is fatal. The Allums have signed up more than 10,000 people to the bone marrow register — at about $55 each — during multiple marrow drives. Their efforts saved five lives last year, but so far the search for a match for their own son has been in vain. The Allums, who home-school their son to keep his exposure to illness at a minimum, also prayed with Bush at the airport. 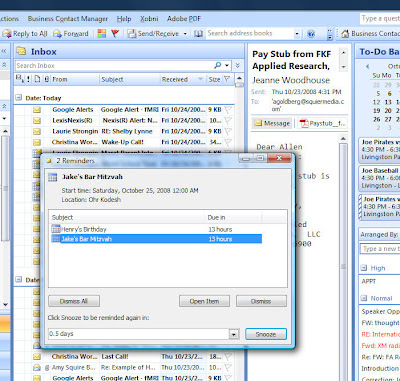 Alexander said his ability to arrange such meetings is the best perk of his position. After the Allums left the airport to each lunch, they were called back by the White House staff for a tour of Air Force One. John just made this video for Hope for Henry. It has some photos and video of you. I guess it answers, "Who's Henry?" for anyone who doesn't know how the Foundation got its name or its start. Hope for Henry Video from Allen Goldberg on Vimeo. Mom can't sleep and I've had a headache for the past two days. Hmmm. Wonder what that could mean. Oh, it's your birthday this weekend, of course. Nothing gets us feeling as down-low, low down as your birthday and your deathday. I don't know what I can do to make Mom feel any better. I actually bought her a couple of things that I plan to give her on Saturday. Everyone likes to get presents, but I wonder if this will just bum her out more. It's your birthday and Mom is getting the gifts, while you are getting rocks (see below) which reminds me of Charlie Brown. 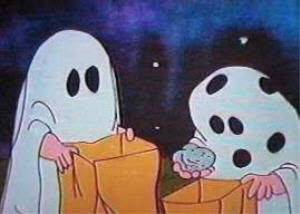 He got rocks on Halloween. This birthday is pretty significant. You'd be 13 on Saturday. It would be your Bar Mitzvah. So instead of spending the morning in synagogue with our family and friends celebrating you becoming a man, we'll be spending the morning in synagogue with family and friends celebrating Jake becoming a man. 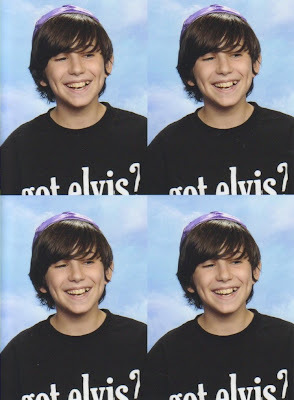 It is a really nice coincidence that Jake's Bar Mitzvah is this Saturday. Ari can't be there, but Simon will. Nana and Papa Sy are coming. I found this picture f you guys from what looks like the start of school a bunch of years back. Check out Helaine and a very young Abby in the background. If I were to generalize, Jake is the cut-up athlete, Ari is the stylish sweet one and Simon is the handsome rogue who will break a lot of hearts when he get older. I wonder how I'd characterize you in 3 words or less if you were still around. Here's how it would go for your brothers: Jack is the brain and Joe is the athlete. Who knows if that'll still be the case years from now. They're still "forming." Let's talk about Jake for a second. He has turned into quite the young "man." I really like him, and like spending time with him. What strikes me first is his energy. He is wired in a good way. And he has Richard's affable charm, and Helaine's wicked sense of humor. You cannot overlook that he is a tremendous athlete. One day he may have to choose between the Astros (his favorite team) and singing his song parodies on Saturday Night Live. Jake is also a leader. He was just elected co-president of his class or the middle school or something. He told us that he was running against the "Gross/Weiner" ticket. Only in a Jewish school! Mom and I bought him a New York Jets Brett Farve jersey for his Bar Mitzvah present. His liking teams way outside this market, the Astros and the Jets, is part of his goofy charm. 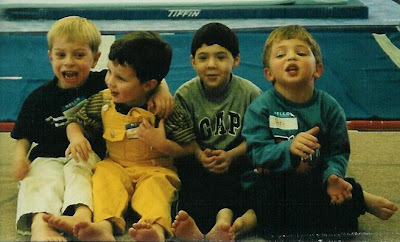 He is also a very good friend to Jack and treats Joe really well - I know he would still be one of your closest friends. I am going to read Torah at the Bar Mitzvah. I am first at bat with the recitation of the story of creation. It goes through all of the days and it is soooo looooooong. A whole lotta Torah goin' on. Not sure if you are supposed to reprint the Torah just anywhere, but this is it. See what I mean. It has taken me forever to learn and practice, but I've been driven to do it to honor you, Jake and Helaine and Richard, who have been such good friends to us. Aunt Jen helped me with it. She could chant this with both arms tied behind her back. Me, a different story. Mom noted that I haven't read or listened to music or anything for weeks and weeks. To me, and to oversimplify it a lot, this is the Bar Mitzvah you'll never have, and I want to do a good job. We'll head over to the cemetery after the lunch. I have this idea about imprinting a message like "We love you Henry" on the rocks we leave on your headstone. There is a Jewish custom of leaving pebbles on graves to show they've been visited. I was thinking there might be a business in etching pebbles for people to use. I bet there is a Jewish Mortuary Association, and you could market through. Whatever. I'd love to have a bunch of different messages that we could leave through the years. We can leave them in a bag tied to the tree so others can grab a nice rock when they visit you. I'm working on it. And if it isn't squeezing too much in, maybe we'll get Joe to his Yankees game before going to the party that night. Both Jack and Joe are invited to the party, and Joe promises to show off his dance moves. I should probably bring the movie camera. Hey, before I go and talking of "squeezing," Joe keeps setting up lemonade stands out front. It seems like every day he is rushing out to sell his wares on the street. Maybe he'll make the move from Joe the athlete to Joe the entrepreneur someday. You gotta love the way he spells cookies. "Eighty percent of success is just showing up." I think he got it wrong. Eighty percent of success is following up. I think I spend most my days following up on things. You say or ask for something once, and then you spend the rest of the week asking again and again and again until it gets done. That's my life lesson for today. How cool is this. I am so excited for Mom. But I probably won't be able to stop worrying until I see it on a bookstore shelf. I just tried to pre-order the book, but the site won't let me 'cause it is only for people who live in Canada. Speaking of bookstore shelves, this is really crazy but when I was walking through a bookstore in Boulder last month that Mom said I had to visit, I started thinking how sad it would be to see your face sitting on a book jacket on a shelf in some store. It seems like a weird thought, but it is like you'd be lonely. 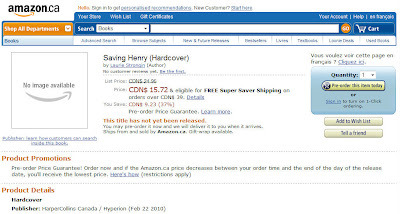 And what might be worse is if the Saving Henry book jacket gets torn or thrown away. Of course, I treat anything with your picture on it like it is a holy thing, but that's me. Maybe your picture won't be on the cover of the book. But if I were designing and marketing it, I'd definitely put you on there. You're impossible to resist. Actually, a picture of you and Mom would be best. That way you won't ever be lonely. It is a love story, after all.